Happiness in the Making: Yo! As DJ Lance would say...these kicks are totally AWESOME! 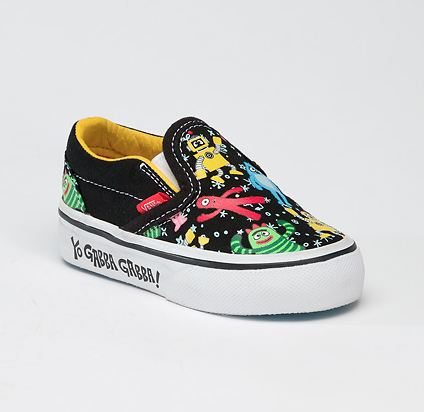 When presented with these Yo Gabba Gabba sneakers that just arrived at Nordy's and Journey stores on Thursday, the little dude was over the moon (think gasping and jumping up and down and even catching some ZZZZs in them). In fact, he could barely decide between the Brobee green ones and the black Vans that featured all the characters. So yah, we're likely creating a monster...especially since yesterday he literally asked to go to the mall and requested his TOMS to go with his ensem. Yikes.